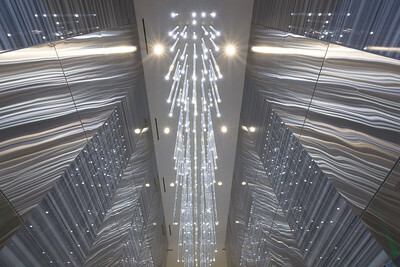 This custom 44 foot long, 242 individually-lit acrylic rod chandelier was designed to make a big visual impact on guests as they first enter the building lobby. 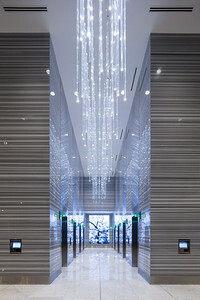 The fixture protrudes out from the elevator lobby into the main lobby to guide and direct them towards the elevator bank. 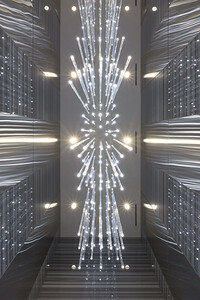 The dimmable fixture reflects off the adjacent glossy marble and stainless steel to provide unique light patterning, and provides beautiful ambient light at night.